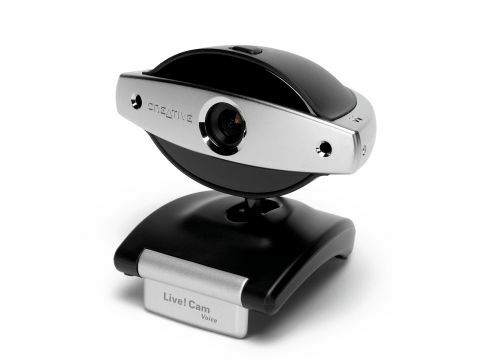 You can pick up a webcam from just about any Internet retailer for under £20, so why would anybody pay £50, the going rate for Creative's Live Cam Voice? There are three main reasons. First, the sensor resolution is fairly high for a webcam, at 640x480 pixels. The software bundle - as usual with Creative - is comprehensive and well written. And finally, the camera is fitted with a noise-cancelling array microphone. The unit itself is small but not miniature, and is oval in shape, with twin microphones positioned either side of the lens. There's a small LED under the lens, which glows green when the camera has power and red when it's active. A single USB 2.0 cable provides all power as well as the data connection. It's mounted on a ball joint so you can move it through a wide variety of angles, and a foldaway clip gives it good purchase on a notebook or LCD monitor. On a conventional CRT, the Live Cam sadly has to rely on its weight to stay put and, as it's light, it can be easily disturbed. Creative provides an extensive software bundle with the Live! CamVoice. The main component is Creative Muvee Autoproducer, a simple video-editing application, which can jazz up a video from captured footage, applying soundtracks and styles, like a promo or music video. There are more serious applets in there, too, which help set up the camera for security applications, or to work with VoIP services like Skype. The two microphones work in collaboration to detect background noise. By analysing the levels of sound reaching each microphone, the driver software determines which sounds are background and which come from somebody in front of the camera. This enables the system to cancel unwanted noise, leaving clearer speech, without the need for a headset. The results are good, with speech as clear as from many headsets, but without the need to press your ears into funny shapes. This is a good camera for anybody who wants to fit and then forget a webcam. The superior sound quality captured by the array microphone is probably worth the extra price, but when you add in the software and the versatility of the camera for VoIP or security uses, it's further justification for its comparatively high price.